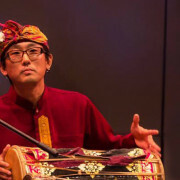 For lovers of Balinese music and dance, this will be a wonderful opportunity to enjoy a “hands-on” workshop and concert. The Music Center in downtown LA will host the Saturday, February 21 workshop and the concert on Sunday the 22nd. Gamelan Sekar Jaya is internationally recognized as “the finest Balinese gamelan ensemble outside of Indonesia” (TempoMagazine). True to Balinese tradition, the Bay Area-based musicians and dancers learn the complex musical figurations and elaborate choreographies through intensive training with master teachers. The orchestra is composed of bronze metallophones, bamboo marimbas, tuned gongs, drums and flutes which the musicians play with technical precision and collective spirit. 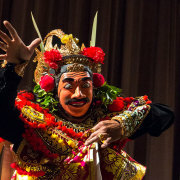 The performance includes the masked dance of Jauk Manis, the “sweet demon” character who is both mischievous and endearing. Both events are free, but the Saturday workshop has limited space and an RSVP is required.